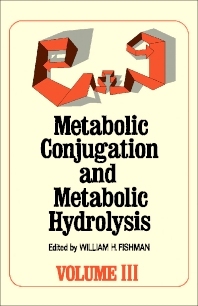 Metabolic Conjugation and Metabolic Hydrolysis, Volume III is a comprehensive account of the status of metabolic conjugation and metabolic hydrolysis. Topics covered range from the metabolism of steroid hormone conjugates and the genetic control of acid hydrolases to acetylation of drugs. Biochemical mechanisms in methyl group transfer are also discussed, along with the bilirubin conjugates of the human bile. Comprised of eight chapters, this volume first looks at the biosynthesis of animal glycoproteins before turning to an analysis of the metabolism of the conjugates of steroid hormones. The reader is then introduced to the genetic mechanisms that regulate acid hydrolases; control of metabolic hydrolysis in the lysosome-vacuolar apparatus; and the biochemical mechanisms underlying methyl group transfer. The final chapter is devoted to membrane phosphohydrolases, with emphasis on certain common features of membrane enzymes or of enzymes associated with membranes. Membrane transferases and hydrolases are also considered, including adenosine triphosphatase and adenyl cyclase. This book will be a useful resource for biologists, biochemists, physiologists, and pharmacologists. IV. For the Future: Biological Activity? V. How Can This Novel Report of Disaccharide-Containing Conjugates Be Reconciled with the Generally Accepted View That Bilirubin Is Excreted as a Simple Glucuronide?